“Read. Think. Learn.” After reading a some posts over at Mental-Multivitamin, you’re sure to hear this mantra more than a few times! This homeschooling mom is also a professional writer, and it shows. She always has a book to recommend, and her writing is absolutely engaging. I rarely come away from her blog without a renewed desire to educate myself, not to mention Savannah! I used to read her blog more than I do now, so everything I’m linking is from a few years ago. Good, meaty stuff, though. I’ve decided to make a series of these musical YouTube finds. Check back on Mondays for a sampling of great music you can listen to for free. This is a recording of Vladimir Horowitz playing Consolation No. 3 by Franz Liszt. If chocolate is recession-proof, then I want my stock in these for the next few years. I think I may just start selling these if times get really bad. 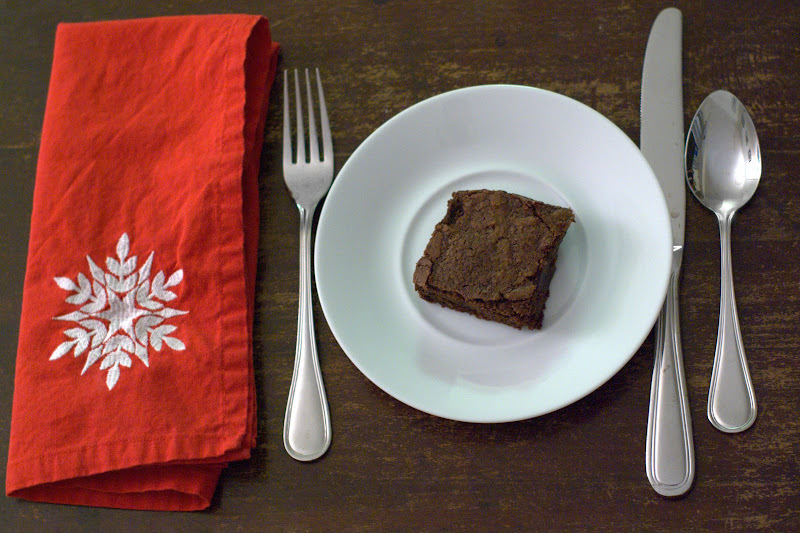 I got the recipe for these chocolate brownies from my second cousin when I lived with her one fall. They were so temptingly delicious, she would freeze individual brownies and only thaw them out on Fridays — just one each Friday, and the two of us would split it. They were rich and dense and chocolaty, and that half a brownie was incredibly satisfying. When the Professor and I make these now, we don’t use the topping, because he doesn’t care for whipped cream. They’re perfect by themselves, or as the Professor prefers them, warmed and mixed in with some vanilla ice cream, Cold Stone style. 1. For brownies: In a microwave or double boiler, melt chocolate and butter; cool for 10 minutes. Add remaining ingredients; mix well. Stir in the walnuts last, if using. Line a 13x9x2 baking pan with parchment paper. (Or greased aluminum foil. Or just grease the pan well.) Pour batter into the pan. 2. Bake at 350 degrees for 25-30 minutes or until a toothpick inserted near the center comes out with moist crumbs (do not overbake). Cool completely. 3. For topping: Melt chocolate chips, water, and butter in a microwave or double boiler; stir until smooth. Cool to room temperature. Fold in whipped cream. Spread over brownies. Chill before cutting. Store leftovers in the refrigerator. The brownies themselves also freeze well. Our Blogging Hero finally returns, after one minor car repair, two long days on the road with a sick mama and baby, one trip to the children’s ER*, and one and a half days of (still in-progress) recovery at the in-laws. And so I come to you between coughs and sneezes to share this classic from my childhood, and to wish you a cozy Christmas Eve with lots of excitement in anticipation of the big day! *Savannah just has a cold, but our pediatrician wanted her seen immediately since she’s so young, in case it was really pneumonia or something. The whole experience was considerably more traumatic for me than it was for her. I will say we were very lucky to have almost no wait before we were seen by the doctor — it may have taken more time to get through the line at the hospital’s Chick-fil-A than it took to get in and out of the ER. I’ve been remiss in posting homeschooling links, but I promise, I have several in the queue! It’s just taking me longer than expected to get them post-worthy. These next few Links for Lena posts will be profiles of homeschooling bloggers who have inspired me. I’ll highlight a few favorite posts, but in general I’ll only be skimming the surface of what their blogs have to offer. These ladies have so much wisdom and so many great tips and ideas. I encourage you to dig through their archives to find things of particular interest to you. Unlike other posts where I link to booklists or descriptions of homeschooling techniques, though, much of what they say is subjective. It will be helpful as you read them to remember that even if you can’t do the things they suggest, you can still have a successful homeschool. No one, not even these blogging moms who seem to do so much, is doing everything. Cindy is a Charlotte Mason/Classical educator in Alabama. I think my homeschool is likely to be very similar to hers, although presumably with fewer pupils. She implements something that she calls “Morning TIme,” a time where she gathers all of her children every day to they spend some time learning as a group — things like art, music, Shakespeare, Plutarch, Bible (including scripture memory), Hymns (to be memorized), Poetry, other memory work, and read-alouds. It may sound intimidating, but from reading her blog, I don’t think it’s a lot of work for her. The memorization is achieved by repeating daily over a long period of time (weeks? ), and the rest she is just exposing her kids to without much in the way of lesson plans. She describes this as something that makes her life easier rather than harder. In order to avoid a blogging drought, and perhaps in part to make up for forcing Harmony to listen to Stravinsky (after all, she does go by “Harmony” and not “Dissonance”), here’s another great youtube find: the second movement from Bach’s little-known concerto for violin and oboe. Midori Goto on violin. I didn’t realize until this year what a rip-off “photo cards” are. We decided that since many of our friends hadn’t seen a picture of Baby Savannah, we would include a picture of her with our usual letter and card. I thought it would be festive to use one of those holiday designs on this year’s picture. But what I want to know is why the photo companies charge $1.00 or more for a “photo card” — which is no different from an ordinary print in their eyes — when a print costs a few cents. That’s some serious markup. So what do I do? Open my favorite graphics editor (if you don’t have a favorite, try Gimp — it’s free!) and make a simple card myself. 1. Create a 4″x6″ image (or 6″x4″ if you prefer landscape), using at least 300 dpi resolution. 2. Copy and paste your digital photograph into the image. Resize it if necessary. 3. Now you have a bunch of white space around your photo. Use a flood fill tool to fill it in with pretty solid colors or patterns. Gimp and other image editors have some default patterns, but you can download more for free at places like Deviant Art. (I’m still trying to figure out how to import Photoshop patterns into Gimp… if anyone figures this out, please let me know!) Or you can create your own by drawing dots or lines or whatever in another image that you leave open; usually you can tell your graphics editor to use that image as a pattern when you flood fill. 4. Add your finishing touches, including some text wishing everyone a Merry Christmas. 5. Send the completed image to your favorite online photo developer. Check retailmenot.com before ordering to make sure you don’t miss a coupon code. If you’re going to order a large number of photo cards, you may want to start with one test print before ordering the whole lot. I got 40 picture cards printed on high-quality photo paper for $8 instead of $40 by doing this. I did the same for my mom and got her 200 for $22 (with a coupon code). Read that again: I could buy 200 for just about half what I would have paid for 40. And I like mine better than the premade ones they offer. I held my breath the whole time; did you? Parents are fragile creatures. We first babies have so much influence over their formative years as parents, and it’s our responsibility to raise them in a way that will produce a well-adjusted, happy parent. Attachment Babying (AB) is a philosophy of responding gently to the parent’s needs and guiding them through subtle actions. As an Attachment Baby, I see my parents as an extension of myself. Sucking on Mama or Daddy’s fingers like they’re an accessory helps me not only to feel connected to them, but it also offers me a chance to participate in their various activities by tasting the garlic Mama chopped while I was napping or leaving a raw spot that will remind Daddy of me while he’s teaching. Parents need to be shown that nighttime is an active part of the day. Those of us who practice AB prefer to do this using gentle techniques, such as Making Cute Noises While Mama and Daddy are Trying to Sleep (MCNWMDTS) or Extended Breastfeeding (EB), where an hour per feeding is a great goal. I have found the first technique to be especially rewarding for beginners, but with a little patience, you can have success with the second. The trick is not to get discouraged if Mama falls asleep while you’re eating. Parents are always looking for ways to express their love in meaningful ways, and you owe it to your parents to give them such opportunities. Elimination Dedicated Babies (EDB) believe that nothing says “I love you” like changing four diapers in an hour. Elimination Dedication also gives your parents valuable experience at important diapering skills, and as a result, they’ll be more confident in their parenting. Not to mention they’ll feel great that they got their money’s worth out of that changing table. Grown-ups these days really like it when things are organic. Organic clothes, furniture, and food can be expensive for your parents, though, and they may feel sad that they cannot afford very many organic things, especially in this economy. As a sympathetic baby, you naturally want to help, but maybe you don’t think there’s anything you can do. If that describes you, then you couldn’t be more wrong. You have the very things your parents want right inside of you! 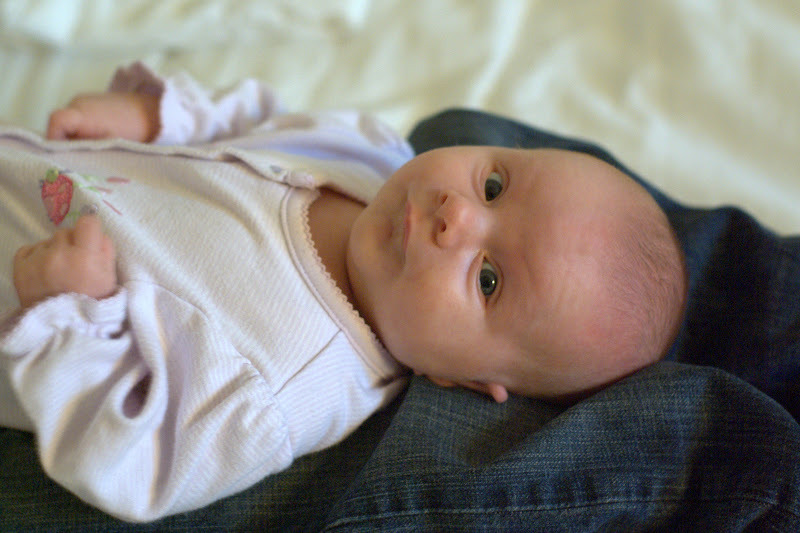 That’s right — your spit-up is organic! Your parents may not be able to buy a sofa made of organic materials, but with just a little effort, you can increase the percentage of organic matter in the one they already have. There are only two of us eating solid food around here, and we both like leftovers, so I only have to choose three meals for this week! We have a two-month-old to take care of, and we’re both starting to feel sick, so you know they have to be easy meals. Monday: Frozen pot pies or pizza to hold us over till we have more time to cook. Thursday: Beef stew. I’m adding mushrooms this time… the Professor said he didn’t mind picking them out. Saturday: Pasta with Feta, Broccoli, and Sausage. I’ve never tried this one before, but it’ll give us a change from our usual rotation of easy meals, and best of all, it doesn’t contain anything the Professor doesn’t like!